We’d love your help. 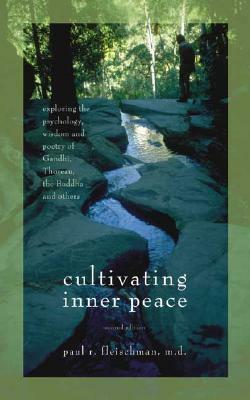 Let us know what’s wrong with this preview of Cultivating Inner Peace by Paul R. Fleischman. The way to inner peace is illuminated in this accessible guide to tending one's inner landscape. The lives of outstanding figures such as the Buddha, Walt Whitman, and Gandhi are used to connect the ideal of inner peace with how real people cultivate peace in their everyday lives. Peacefulness as dynamic, selective, and egoless is shown through the constructive act of choo The way to inner peace is illuminated in this accessible guide to tending one's inner landscape. The lives of outstanding figures such as the Buddha, Walt Whitman, and Gandhi are used to connect the ideal of inner peace with how real people cultivate peace in their everyday lives. Peacefulness as dynamic, selective, and egoless is shown through the constructive act of choosing different ways of life, such as having a smaller family or a more modest career. A message of hope and inspiration permeates this pragmatic approach and is exemplified by the author's own practice of meditation. To ask other readers questions about Cultivating Inner Peace, please sign up. Paul R. Fleischman has been a Vipassana meditator for over 30 years. His prose is beautiful. He has taken on the work of explaining this kind of mindfullness and how to get there. Not an easy thing to do. I read this book while doing service at Dhamma Dvara, a Vipassana Center in Germany. It is such an inspiring read! I enjoyed every page of it. Fleischman introduces the main principles that are the coordinates for a life full of inner peace. And then chapter by chapter, he describes each principle and presents people who are impersonations of these coordinates. He draws from examples of their day-to-day life, poetry, writings etc. This book is a must if you seek great inspiration, ideas and exam I read this book while doing service at Dhamma Dvara, a Vipassana Center in Germany. It is such an inspiring read! I enjoyed every page of it. Fleischman introduces the main principles that are the coordinates for a life full of inner peace. And then chapter by chapter, he describes each principle and presents people who are impersonations of these coordinates. He draws from examples of their day-to-day life, poetry, writings etc. This is a book that I would return to again and again. When I am reading this book, I feel like Buddha is talking to me in person using a language that I could understand. Instead of telling me what I should do, it is teaching me how I should face and solve my own problems in my specific social context, using my own strength. It reveals a world of inner peace that everyone could cultivate by him/herself. This is a jewel of a book, which should always be close at hand as an inspiration on how to live fully by seeking peace within. Although Paul Fleischman is a vipassana medidator, and describes how that tecnique has helped him reach inner peace, the wonderful passages relating to such diverse personalities from different cultural backgrounds show that peace can be achieved by those willing to live a simple and fruitful life close to nature and be compassionate with themselves and others. This book was well written, but in a very academic way. At times, the author seemed like he was trying very hard to be poetic, so it comes across as stilted. He's TELLING, but it didn't really show a picture in the mind or stir any feeling. The book was just too dry and quite frankly boring. I had difficulty reading it for more than 10-20 minutes at a time. It actually has taken 2 years for me to finish...that's how uninterested I was. Very peaceful read. Every page in this book has a very peaceful vibration to it. This is one of those books that will stay on my kindle forever and will get back to this book a lot of times. The book manages to make you feel inner peace while letting you experience the the insignificant nature of our thoughts and body since all of that is impermanent in nature. Although I didn't always agree with the author, I found his insights into some of the world's great thinkers fascinating and insightful. Paul R.Fleischman’s legacy book, "Wonder: When and Why the World Appears Radiant" expresses Dr. Fleischman’s knowledge as a psychiatrist, scientist, meditator, poet, lover of literature, and world traveler. Each chapter builds on the next and takes the reader deeper and deeper into the understanding of human life’s connection to all life. Readers of the book say that the writing is powerful and th Paul R.Fleischman’s legacy book, "Wonder: When and Why the World Appears Radiant" expresses Dr. Fleischman’s knowledge as a psychiatrist, scientist, meditator, poet, lover of literature, and world traveler. Each chapter builds on the next and takes the reader deeper and deeper into the understanding of human life’s connection to all life. Readers of the book say that the writing is powerful and the concepts build on themselves like a suspense novel. Wonder makes an impression that commands full attention. The book makes a significant contribution by bridging the two domains of scientific and religious cosmology, and it does so with inspiration and elegance. It connects the dots of biology, physics, and spirituality and helps to crystallize thoughts, and to generate new thoughts and insights. Paul R. Fleischman is also the author of, "Cultivating Inner Peace: Exploring the Psychology,Wisdom and Poetry of Gandhi, Thoreau, the Buddha, and Others," "Karma and Chaos," "You Can Never Speak Up Too Often for the Love of All Things," "The Healing Spirit: Explorations in Religion and Psychotherapy," "Spiritual Aspects of Psychiatric Practice," "Vipassana Meditation: Healing the Healer and the Experience of Impermanence," and "The Buddha Taught Nonviolence, Not Pacifism."